Photography is the art of choice to capture a most special moment in life, a moment linked to an intimate experience that is part of a wider story one wishes not to be forgotten. It is universally recognized as the art that transmits an image or a reproduction of reality, a fraction of time, like a mirror stretching in front of the world spectacle. The photographer is the artist whose mission is to capture the spectable, construct and create the image thru the mastery of forms, colors, formats, technology...like a digital ‘painter’ for whom the natural environment is a canvas. The island of Bora Bora is home to such an artist, his name is Damien Dunant - He is the founder of Bora Bora Photo Lagoon and the Love Boat tour, a romantic and magical photo safari for couples celebrating happiness in paradise. Damien grew up in southern France where he developed a deep passion for nature, water sports, diving, fishing, snorkeling, and photography as a hobby. His professional experience is rooted in tourism, with seasonal travels stretching from the beaches of the French Riviera to the mountains of the Alps and the Canary islands of Spain. As a young dreamer in search of Robinson Crusoe style adventures and exotic living, it is no surprise that he eventually landed on the shores of French Polynesia. Inspired by it's beauty, it's culture and the recognition that photography is at the center of the exotic dream, he turned his childhood hobby into a full blown enterprise and founded Bora Bora Photo Lagoon. The signature of the Love Boat tour is the celebration of your honeymoon thru a unique eco-guided boat trip around the lagoon. 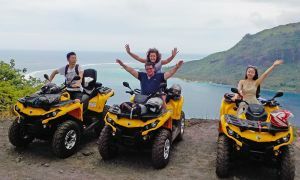 The tour is your very own private promenade in paradise, meticulously organized by a fun & professional team who has strong work ethics and exclusive access to the best spots. As a client of Pacific For Less you will have the privilege to customize your tour; whether you choose a 30mn photo shoot at your hotel or a 30mn snorkel stop at the Coral Garden, your guides will be entirely devoted to your special moment, leading you all the way around Bora Bora's gorgeous seascape at your own pace. On the menu: snorkeling, discovery, bathing in crystal clear waters, tasting coco-champagne at the Motu … playing, living, feeling the timeless gift of astounding nature all around you. No need to bring a camera, couples are the stars, Damien & his crew will do that all for you! Life is a precious gift and it's best moments often too short...but for those who live in the fast lane and still pursue their dreams, Bora Bora Photo Lagoon & the Love Boat tour is a testament to the fact that time does not always fly - sometimes it simply stops, frozen in paradise, sealed in the memory, never to be forgotten. Far and away the best tour you can experience on Bora Bora is our exclusive private lagoon safari! We asked wildly popular Love Boat charter company to design something perfect just for our clients. 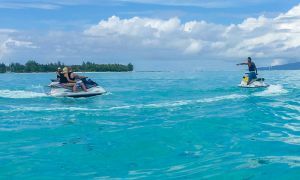 Circumnavigate the island of Bora Bora on board a comfortable Bayliner speedboat. Our couples learn more about the island and its people in a few hours with a charming and intelligent guide than most people who frequent the islands would after many years. Visit all the hidden hideaways, romp on pristine white sandy beaches and private motus, and sip champagne from a coconut while basking in the warm lagoon. As a private charter, this tour is completely tailored to your needs, wants and desires. As your guide is also a talented photographer, you will be left with a CD full of beautiful images captured of the two of you on your journey through this natural paradise, a wonderful keepsake of your trip to share with friends and family on Facebook, and spark your memories for a lifetime. The perfect tour for snorkel lovers, designed by The Love Boat charters exclusively for clients of Pacific For Less! 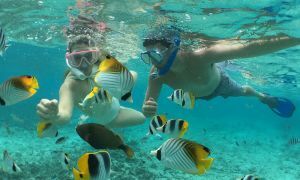 Visit the best snorkel spots in the lagoon of Bora Bora on board a comfortable Bayliner. 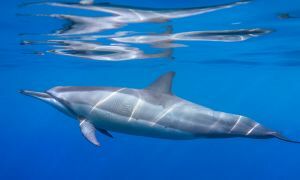 Marine life naturalists lead you to two wildly different, but equally spectacular snorkel sites around the Bora Bora lagoon. Explore an underwater wonderland teaming with colorful tropical fish, and encounter sting rays, the majestic manta ray, and fascinating and beautiful coral garden inhabitants. As a private charter, this tour is completely tailored to your needs, wants and desires. Includes all snorkel equipment and mineral water. The romantic beauty of the Bora Bora lagoon at sunset is a sight to behold. Onboard a comfortable Bayliner, explore the Bora Bora lagoon at this most beautiful time of day, toast your lover with champagne served island-style from a coconut, and soak up the quiet ambiance and breathtaking surroundings. 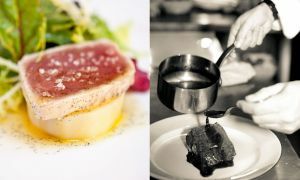 (Tip: It's perfect to combine this trip with a night out for dining on the main island! The Love Boat charters will pick you up at your resort, and drop you off on Bora Bora just in time to dine at one of the excellent restaurants on the island.) As a private charter, this tour is completely tailored to your needs, wants and desires. 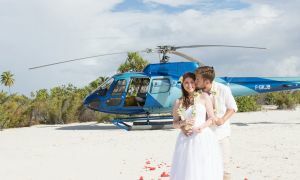 As your guide is also a talented photographer, you will be left with a CD full of beautiful images captured of the two of you on your journey through this natural paradise, a wonderful keepsake of your trip to share with friends and family on Facebook, and spark your memories for a lifetime. Experience the delight and beauty of the Polynesian sun over the island`s famous turquoise lagoon with few other couples. While you glide over the tranquil waters you will be served a complimentary champagne in a fresh coconut, and leave with 40 photos to remind you of the unforgettable experience. The charter will pick you up and drop you back to your resort.